Our linkable product is made for the roofline of your home and eliminates the hassle of tangled lighting cord and broken bulbs. Simply measure your roofline (long runs, gables, and peaks), convert to inches and divide by 44 (the length, in inches, of each of our linkables). This number is how many linkables you will need. Linkables give a professional, breath-taking display year after year. Our wreaths and garland are commercial grade quality and add an element of tradition and interest to your lighting display. Identify areas of your home or business suited well for garland, such as columns, porches, and fence lines. Wreaths look best hung in front of windows or in the empty space of a peak. The look of fresh greenery is timeless. Our high quality, long lasting holiday displays are a great addition to add something different, fun, and exciting to your home or business. 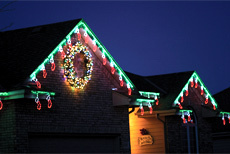 Our high quality incandescent or LED displays will give you enjoyment for many holiday seasons. Finally, finish your lighting display with lights in your trees and bushes. Our starbursts are a great alternative to spending hours wrapping a tree with lights. 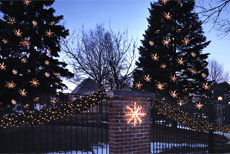 Starbursts hook easily onto any tree and illuminate brilliantly. Use our light sets to drape in low bushes and shrubs. Amazing Holiday Lights Decorating staff is always here to help you with your selection or answer of any your questions. Contact us anytime for assistance. 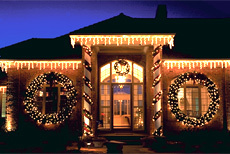 Amazing Holiday Lights Decorating also provides professional installation of our lighting products. 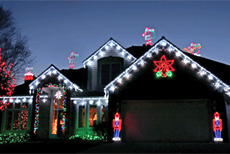 This full-service approach to holiday lighting includes installation, removal, storage and maintenance of your lights. Learn more about our professional installation service.